The city's largest hotel, Sheraton Grand Phoenix is a contemporary haven in a prime location. Unpack and unwind in stylish rooms and suites, featuring modern essentials, gorgeous city views and a thoughtful collection of signature amenities. Explore a compelling collection of vibrant attractions, including Talking Stick Resort Arena, Arizona State University, CityScape, the Encanto Historic District, Chase Field and Heard Museum. 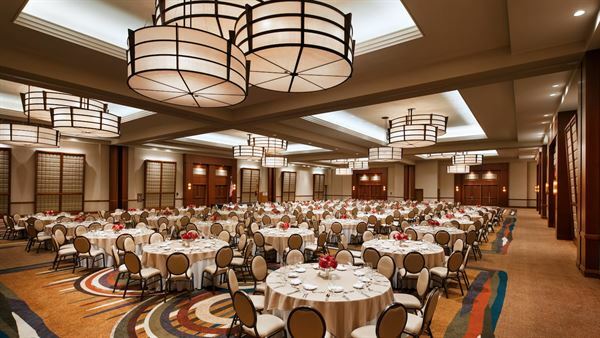 Discover flexible event space for corporate meetings, magical weddings and unforgettable social affairs, all within steps of the Phoenix Convention Center. After a day of business or fun, refresh in our sparkling pool, sip cocktails in our stylish lounge or sit down to delectable local fare at our inviting District American Kitchen & Wine Bar. Just 10 minutes from Sky Harbor International Airport, near endless entertainment options, our hotel is a welcoming sanctuary in the heart of Phoenix. Please see website for a complete list of event spaces.